I’m so excited to finally share some big news with you all. After months of searching and putting offers on six different houses, Isaac and I are officially home owners! We closed on our new home yesterday and are in the process of moving everything in this weekend. A ton of our amazing friends and family helped us out yesterday and we were able to get all the big stuff (including our bed) into the new house so we actually slept there last night!! Boxes are literally everywhere but we really love the house and it already feels like home. This post is going to be quick because we still have a lot of cleaning to do today, but I HAD to pop in to share the news and the recipe for these delicious little cookies. I think they should be called packing procrastination cookies because last week when I should have been packing away all of the kitchen stuff I was baking cookies instead. Oops. Oh well! They were easy to whip up, only required one bowl and they definitely came in handy on the nights that we were up until the wee hours packing. Plus they have the winning combo of peanut butter, chocolate and coconut so they’re absolutely delicious. I took a few to a party last weekend and everyone loved them — including all the kids. 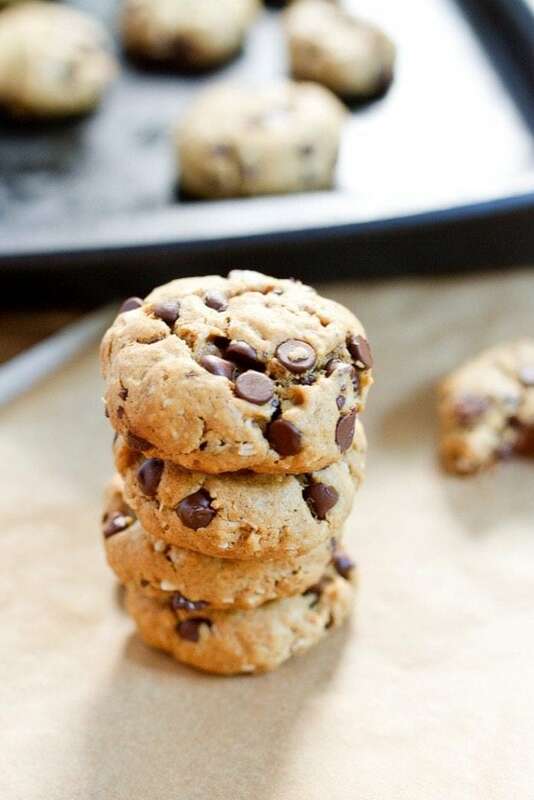 These gluten-free peanut butter chocolate chip cookies are sweet without being over the top sweet. 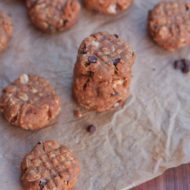 They have an amazing peanut butter flavor and a little bit of crunch from the unsweetened coconut. Kids love them! Preheat oven to 375 degrees. Add peanut butter, brown sugar, and egg into the bowl of a stand-mixer and mix for 2 minutes on medium speed. Add vanilla extract, flour, baking soda and salt, mix on low for 30 seconds. Stir in remaining ingredients. Refrigerate dough for 5-10 minutes while oven is preheating. Using a tablespoon, make heaping 1-inch dough balls and place on parchment paper. Press down lightly and bake for 10 minutes, until edges are lightly browned. 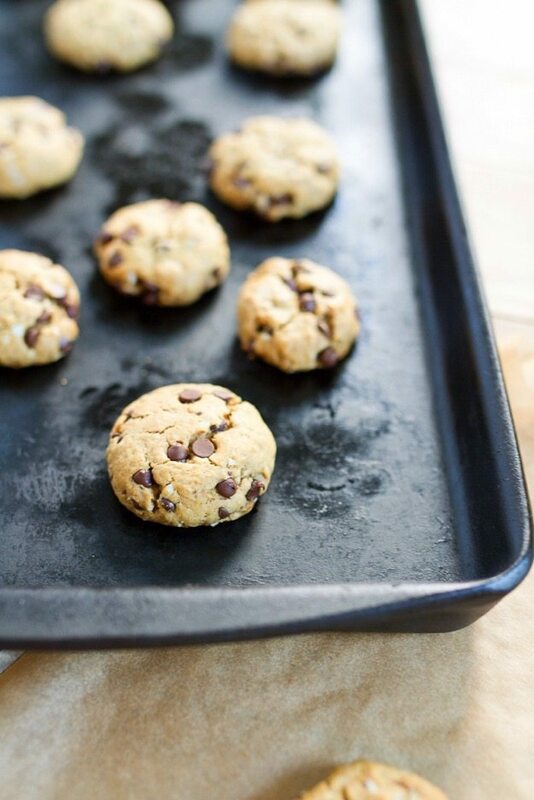 Remove and let cool on baking sheet for 4-5 minutes, then cool on a wire rack. Adapted from Heartbeat Kitchen’s Peanut Butter Compost Cookies. 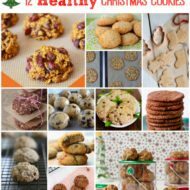 If you happen to try the cookies be sure to let me know how the turn out by leaving a comment on this post or sharing a photo on social media. <– Just don’t forget to tag me! Seeing your EBF creations literally makes my day. 🙂 Happy weekend. They look so delicious! May have to make some after my exam on Monday- they look like perfect study fuel!! Congrats on the new house. This cookies look amazing! Congratulations on the new house! Congratulations on your new home! That is so exciting! 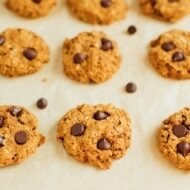 The recipe for these cookies looks super yummy, I will definitely have to try it out! Yay! Congrats, congrats, congrats! And mmm these cookies look delicious! Congrats on your news! 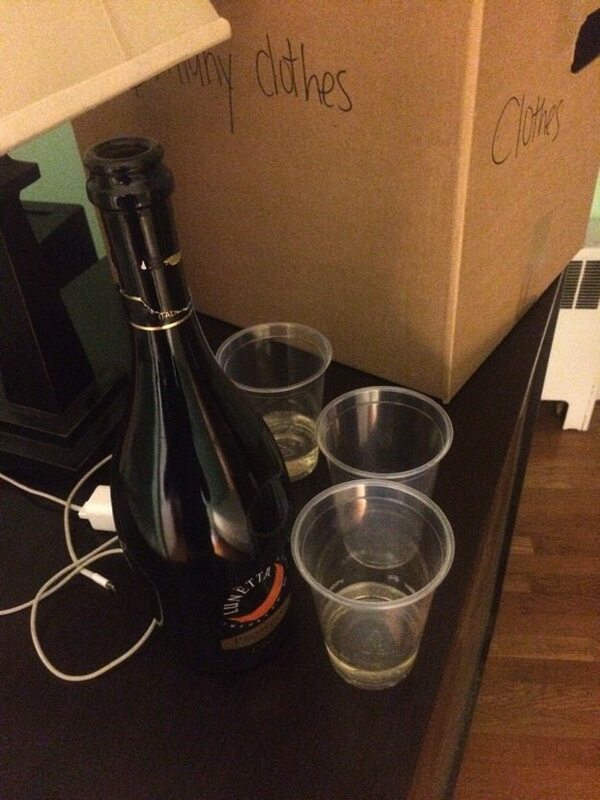 Good luck with moving. The cookies look great!! Congrats, and congrats, with more congrats!!!!!!!!!!!! I remember our signing for our first house- a big step in a life!!! 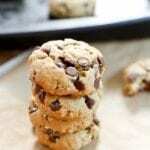 And I am making these cookies tomorrow. Congratulations!! Thats so amazing and such a big step! These cookies look amazing! I know how it feels to have a new home. I moved myself last december. It’s a great feeling. One question for the cookies. Can I replace the coconut with something else. Thank you so much for the kind words about our new home, Lyne. I bet chopped nuts would work great in place of the coconut. 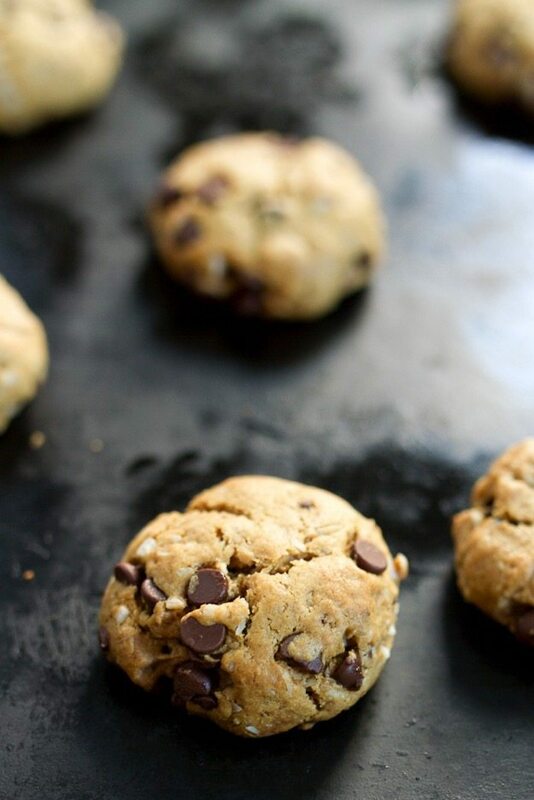 I made a very similar recipe to these recently, but used whole rolled oats instead of oat flour! I’d be curious to try these and see how different the texture/flavors are. Congrats!! Just moved from Richmond…I wonder if you looked at my house when it was on the market? We were by Mary Munford. Congratulations on your new home! These cookies look delicious! these cookies look delish. congrats on the new house! Congratulations on closing! I hope you are all settled in the new house! What an exciting time for you! I always find my way into the kitchen to procrastinate too – good things usually come from that though 🙂 Congrats again! Yay!!! Congratulations on your new house! SO exciting!! 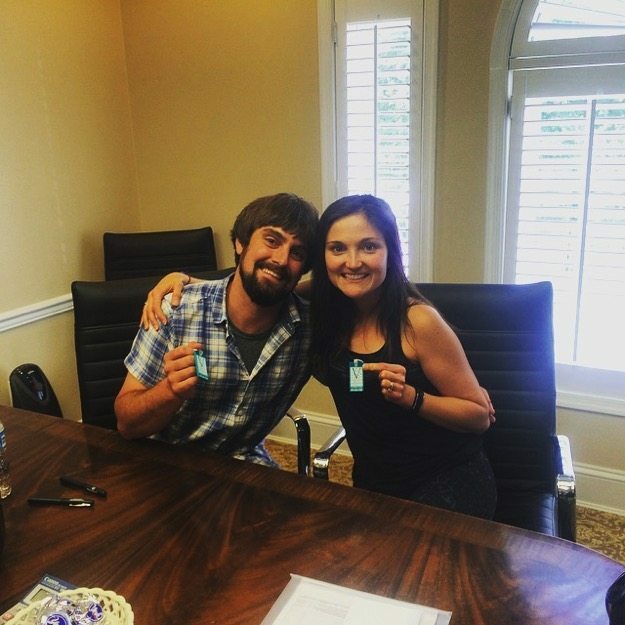 Congrats on becoming homeowners! So exciting! And thanks for sharing this recipe. 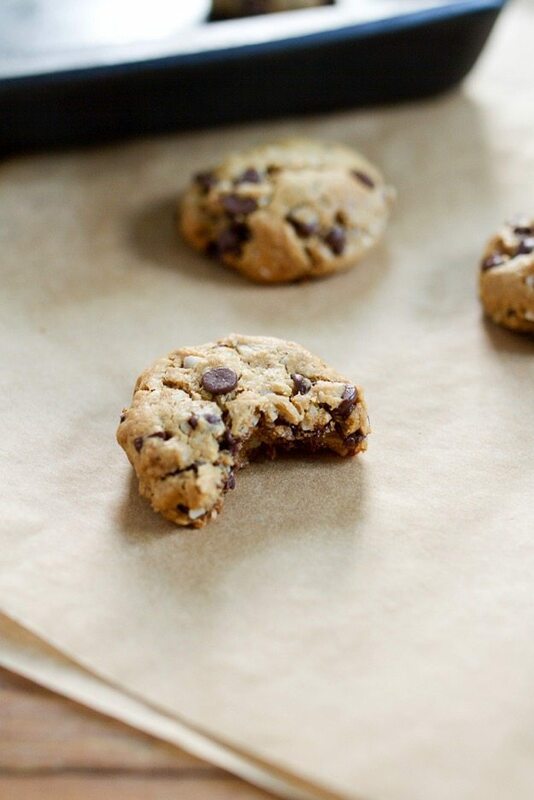 We are moving this week as well, so may need to whip a batch of these cookies sooner rather than later! That’s so exciting! Can’t wait to see pictures of it! Do you think a flax egg would work instead of a regular egg?